The Library’s founder Redmond Barry had a vision of a ‘voluntary university …a great emporium of learning and philosophy, of literature, science, and art’[i]. As a Library, we are many things, but at our heart is Barry’s vision: a public reference and research library for all, with resources of great breadth and depth to meet the needs of both the common and the obscure, the casual and the serious, across the range of human knowledge. The depth of our collection was brought home to me recently when a patron requested assistance on researching the indigenous people of East Siberia. Among a range of items, one book caught my eye. 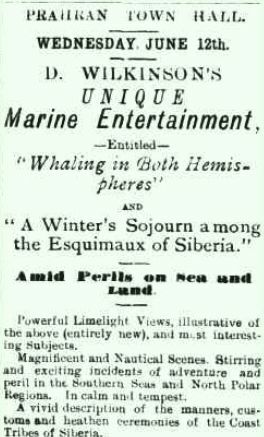 It is titled Whaling in many seas and cast adrift in Siberia by David Wilkinson. An obscure item, rarely used, the author’s style is prosaic, perhaps not always capturing the excitement and uniqueness of his story and experiences. But this is an extraordinary tale giving insight into both 19th century whaling and the daily lives of the Chukchi people of East Siberia. It is a grand adventure that starts and ends in Melbourne. 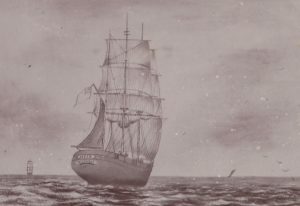 David Wilkinson joined Victoria’s first whaling expedition, aboard the ship Japan under the command of Frederick Barker.[ii]. On 5 March 1869 Japan weighed anchor in Hobson’s Bay and commenced a voyage from which she would never return. The whale hunt took the ship deep into the sub-Antarctic, then across the South Pacific. Finally they sailed north through the Bering Straits into the Arctic Ocean. To that point it had been a successful voyage, but their zeal for the catch took them into dangerous waters. The days were getting shorter, the weather fouler. They left their retreat too late. Caught in a ferocious storm at the whim of the wind, the ice and the ocean, the ship ran aground and was smashed to pieces. Most of the crew struggled through the freezing water to shore, but a number drowned. One officer, Coles, became tangled in rope and was dashed against the ship’s side before his companions could cut him free. Onshore, with no supplies and only the sodden clothes they stood in, their prospects were bleak. Seamen sat to rest and died quickly of exposure. The surviving men started walking forlornly towards the distant mountains. Several times Wilkinson sank to the ground but was dragged up by his companions. He walked on in a haze, finally collapsing, unconcious. He awoke in a warm hut, covered in furs and attended by several Chukchi women. Remarkably 27 of the sailors had survived and stumbled into a Chukchi village. These Chukchi lived a precarious existence on the Arctic coast of East Siberia, surviving through hunting and fishing. They were extraordinarily generous to the castaways, looking after them through the winter. 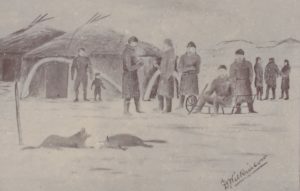 David Wilkinson was adopted by a young Chukchi named Tarrugee, and his family. Tarrugee had broken his leg, a near death sentence for a subsistence hunter. Wilkinson was able to set the leg in a rudimentary splint so it healed. Later he tried unsuccessfully to learn the Chukchi language but Tarrugee had more success learning English. The Chukchi did have some contact with the outside world, trading with whaling ships, but this narrative provides a rare and valuable insight into their day to day lives, their hunting, their ceremonies, and their customs. [iii] The sailors experienced at first hand the harshness of existence on the shores of the Arctic Ocean, where the spectre of starvation is rarely distant. They owed their lives to the Chukchi. 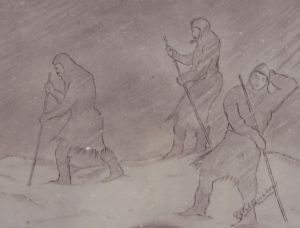 Once the winter had passed, the men, with guidance from the Chukchi, set off to walk to Plover Bay and then Indian Point in the hope of finding the American whaling fleet. They moved in separate groups according to health and fitness. Wilkinson travelled with two other sailors, one of whom collapsed and died on the journey. Finally they reached Indian Point where several ships were anchored. 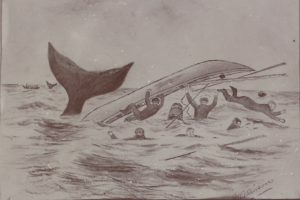 The adventure should have ended there, safe and warm on a sturdy whaler, however they were about to witness, at first hand, one of history’s greatest maritime disasters. The American whaling fleet, some 39 ships, encountered difficult ice conditions, that worsened by the day. 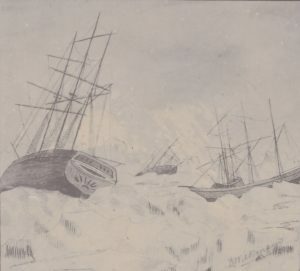 Soon the majority of ships were trapped in the ice and slowly crushed. 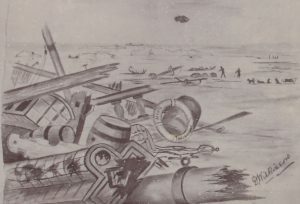 Thirty-two ships were abandoned, including the ship carrying Wilkinson. More than 1200 crew, wives and children dragged whaling boats across the ice and then rowed across open water to the seven remaining ships. Remarkably no lives were lost. 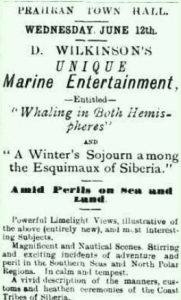 It marked the end of the great days of American Arctic whaling, no doubt to the relief of the poor hunted and harried whales. David Wilkinson eventually arrived back in Melbourne, via Hawaii, New Zealand and Sydney, at the end of December, 1871. In 1895 he gave public lectures recounting his fantastical adventure. His talk was illustrated by his own drawings. These also appeared in his book, published ten years later. This is just one of several million books at the Library, but it reminds us of the huge and varied body of knowledge available for reference and research. [iii]William Hulme Hooper, an officer on HMS Plover, stationed from 1848 at the entrance to the Arctic Ocean as part of the search for Franklin’s lost expedition, also wrote an outsider’s account of the lives of the Chukchi. His was another grand adventure, iced in on the Siberian Coast, then travelling by whaleboat along what was then Russian Alaska and then down the McKenzie River through Canada to Hudson Bay where he obtained passage back to England. The privations of the journey greatly effected his health and he died, aged 27, just after completing his book Ten months among the tents of the Tuski . Great post Andrew. What a ripping yarn! I thoroughly enjoyed this unexpected historical story. Thank you. My great grandfather, Juan Otago, was on that ship. He had worked for Robert Towns and with Capt Barker before. I looked up the book a few years ago but have not yet gone back to read more. It did explain why I lost him in my research for a while and then refound him on a ship coming from NZ as a passenger who was retrospectively licensed as crew. He was originally from Callao in Peru. It is hard to believe how far the ships went in search of the whale. Wow, what a fantastic connection Margaret. David Wilkinson is my 3rd Great Uncle. I have been fascinated finding out about him, his stories and his illustrations. So happy they have been preserved.